More feasting pictures again! This time round it was a dual celebration since it's my aunt's birthday on Thursday. My mother decided to bring her out for an impromtu dinner here as she likes their Sang Har Meen. Traditionally you eat noodles on your birthday as the Chinese believe this means long life. No Yee Sang this time round as my mother was getting quite sick of it having eaten it eight times already. Not sure if any of you are experiencing slight problems with the quality of food during this festive season but I've been finding items not fresh or not up to the mark. I suspect the restaurants had to make do with no supplies last week by stocking up items hence the food quality has been compromised. It happened again for us here as the prawns weren't that fresh but the noodles were as delicious as ever. We ordered their Sengkua or Hairy Gourd with Home made tofu which is my family's favourite. Everyone loved this as the vegetable was tender versus the old ones you get at other restaurants. Since it was only the four of us as Splashie Boy had another dinner at Hyatt Saujana, we ordered more noodles. Another of my favourites, their Fried Tung Fun. 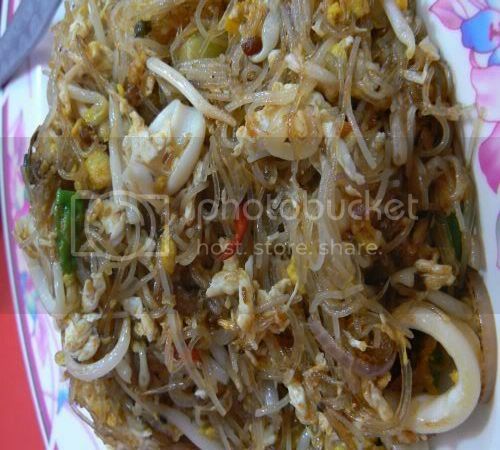 My mother had asked them to mix beehoon in the noodles as they believe eating too much Tung Fun is bad for your health as it does not digest that well. This was extremely delish and came with lots of calamari rings, prawns and bean sprouts. 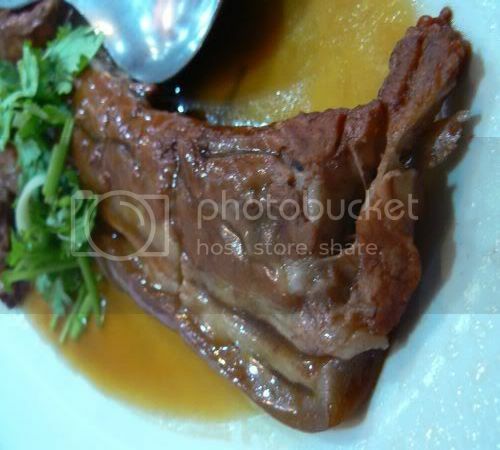 We saw the other table enjoying this hence we ordered the Nam Yue Pork Ribs. Unfortunately it looked better than it tasted. The meat was slightly tough and lacked much taste. After dinner, my mother was miffed with my aunt and uncle as they beat her to footing the bill last night especially since she was the one who had invited them for dinner. Hence you don't see any prices for the items we ordered since I didn't get a chance to look at the bill. 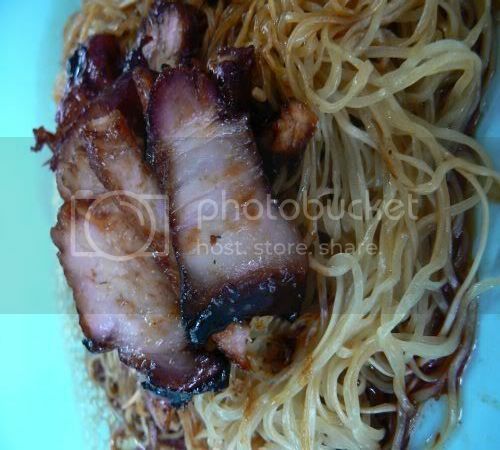 The food was actually too much for the four of us hence we had to doggy bag the noodles and pork ribs home. Incidentally, business in Green View is super good as the place was packed that it was super noisy there. They have even expanded and now occupy four shoplots. 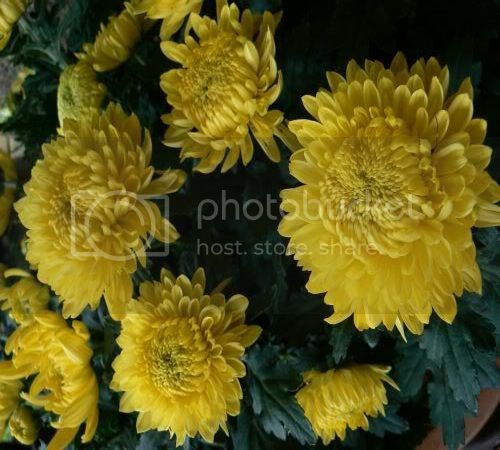 For my last visit to Green View, click here. Incidentally it was also for Chinese New Year. All of you must be wondering why I've been posting about Wantan Mee recently. I actually had this on Valentine's Day with my friend but refrained from posting this since it wasn't open for business last week. Coincidentally since Hung Kee was the only place opened during Chinese New Year, I had another round of Wantan Mee in a span of two weeks. I've been super keen to try this place ever since my friend brought me the uncooked noodles to try. Although I didn't get to taste them as my mother ate all of the noodles, I knew I had to sample these noodles as my mother raved about their texture. Incidentally if you buy these noodles home to keep, there's no harm in storing them in your fridge longer. The longer it stays in the fridge, it tastes better. My friend who has been eating here for some time remembers it being run by an old lady who has since passed down her stall to this young couple. She's even taught the man to make the noodles which he does by hand and machine every day. 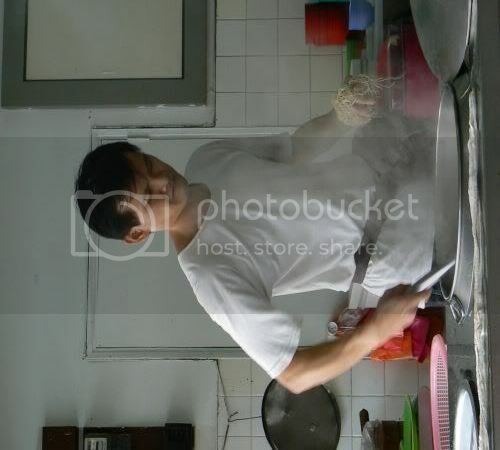 It's interesting to observe how he cooks the noodles in a big pot of boiling water. Once it's ready, he uses a metal strainer to scoop up the cooked strands and plunges it in the cold water next to his pot of boiling water. 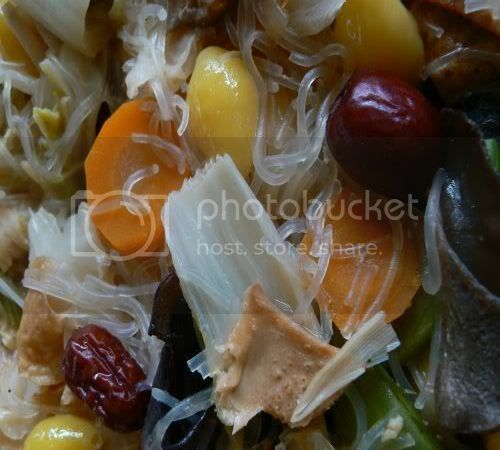 This is to remove the alkaline water (kan sui in Chinese) which sticks to the noodles. Then he plunges it in the boiling water again quickly to heat it up and drains the water before adding it on the plate. 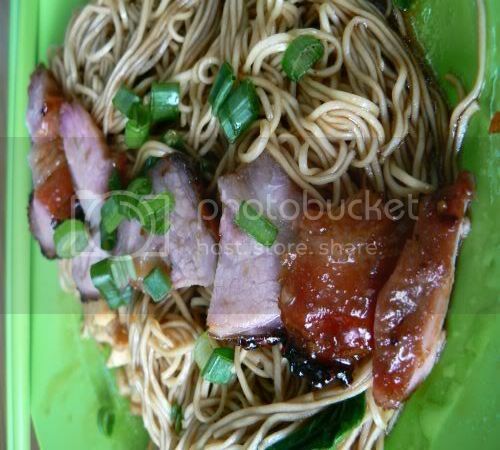 Chopped char siu and spring onions is added on top of the noodles which you toss in the mixture of soy sauces and oil for flavour. Although the noodles were top notch, I wasn't too enthusiatic about their char siu and wantans. Their char siu lacks the black sticky charness I like in my char siu while their wantans were really tiny and lacked much taste. It's been a great weekend: met a few food bloggers or what is known explicitly as Floggers. No pictures from me as there'll be lots from the others with the hawker food crawl we did (pretty mild as it was only 3 outlets) and a dinner organised by Audreycooks in honour of Rasa Malaysia who visited from the USA. It was good to catch up with people who love food and amusing to see the cameras out in force to record every momentous bite. Definitely need to get another gathering of Floggers together as it was full of fun and good food. Since I don't have any tempting chicken wings and balitong pictures, you just have to settle for last week's traditional Lou Sang instead. It's a yearly affair we have with my friends. The original plan was to head towards Cheras (totally uncharted territory for all of us) and indulge in highly recommended chinese food somewhere near Cheras Leisure Mall. Unfortunately we had to ditch that plan since that place was fully booked. Hence we decided to head here instead as tables were readily available. This time round, I managed to snap pictures of the kitchen in action. The last time I was there, I had no idea I could observe the ongoings of the kitchen from the side of the restaurant until my friend informed me of it after the dinner. 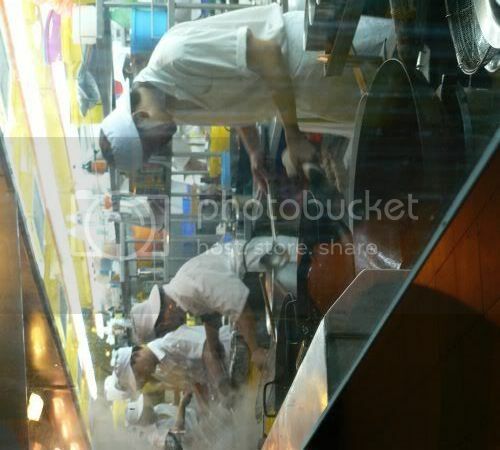 There's a line of cooks each manning a wok and constantly churning out dishes. After each dish is cooked, the wok is cleaned with a wooden brush and water. Since they're using cast iron woks, it's always important to avoid removing the layer of oil with detergent or soap. Sorry for the not too fantastic picture as I had to snap it through the glass window which wasn't too clean. First dish was the Yee Sang (RM38++) which was served with raw salmon sashimi slices tossed with lime juice. When the waitress added the five spice powder and pepper which came in red and green packets, she uttered New Year greetings. 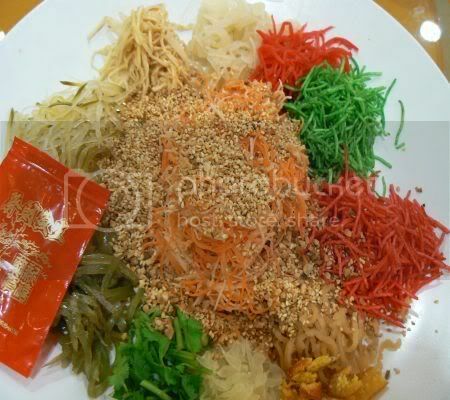 Since the belief is tossing yee sang or what we call lou sang can grant your wishes, we were boisterously yelling out what we wanted - good health especially for my friend's mother who's going for her bone marrow transplant next week, prosperity and lots of luck. Even my friend's young son, Nicholas joined in the fun although most of what he tossed around almost ended up on the table. The Yee Sang here is pretty good with slices of preserved lemon peel and lots of pomelo sacs in their mix. Marmite Pork Ribs (RM18++) came next and it was so sinful and good especially with that sweet and slightly saltish taste which reminds me of my childhood meals. I especially like the teeny crunchy black bits that were sticking to the ribs, absolutely delish. We wanted to order the barbeque fish as my friend had it before which was very good. 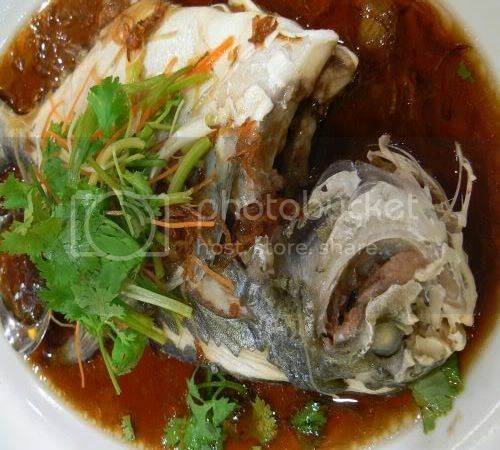 However they don't serve it during the festive season so we settled for the perennial favourite, steamed fish. When the dish arrived, we were all puzzled with what fish it was since it didn't look like anything we usually ate. Turns out it was a Silver Pomfret (RM45++) and it was extremely good. This was voted the best dish of the night as the flesh of this fish was fine and sweet tasting. 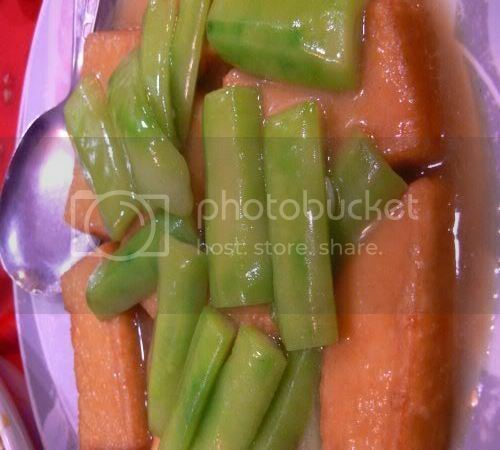 Another favourite was the fried baby french beans with garlic (RM15++). 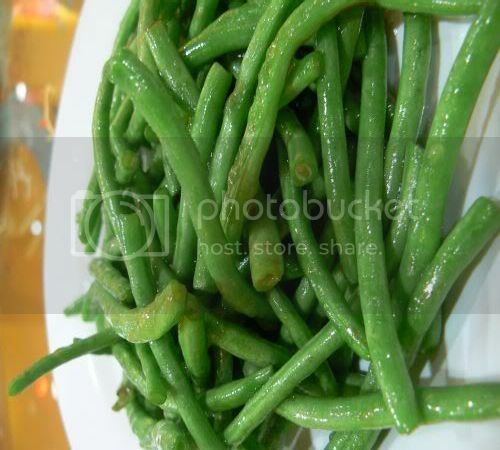 I love these french beans as they're nice and crunchy but not chewy like the normal french beans. The last time we ate here, we tried their Salted Egg Yolk Crabs (RM38++ per kg) and felt the crab pieces needed to be cut smaller to allow the salted egg yolk to permeate the meat. The restaurant seems to have taken that feedback to heart as the crabs now are so much better - it's in smaller pieces and well coated with lots of salted egg yolks. 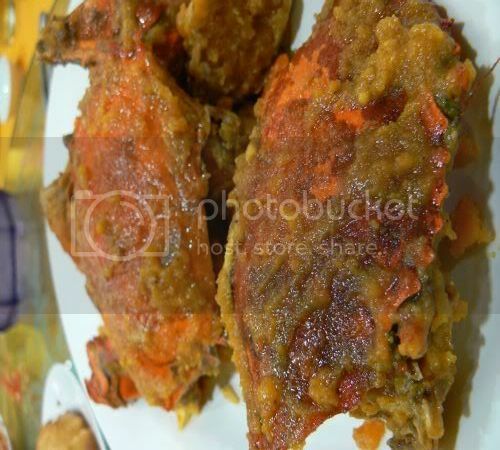 This elevates it to the best Salted Egg Yolk Crabs we have eaten so far. We also tried their Claypot Butter Crabs (RM38++ per kg) which came highly recommended by food bloggers, Precious Pea and Life of the Food Lover. 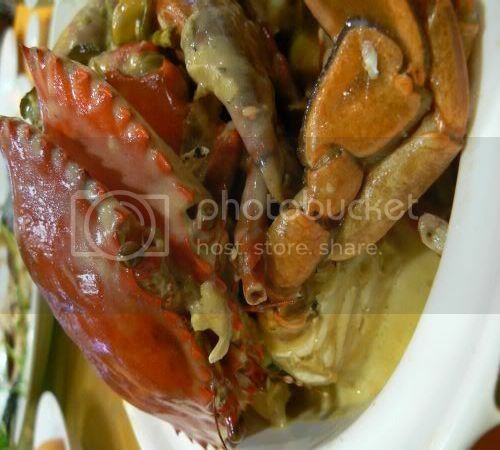 Although the crab meat for this dish was good, we felt the sauce was not as tasty compared to Pantai Seafood's butter crabs. 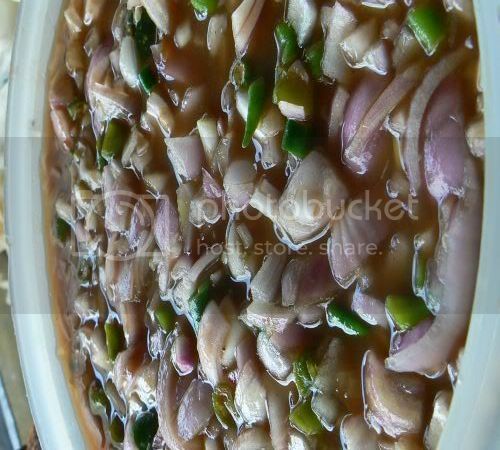 The sauce was also quite spicy with the addition of green chillies. We finished up with a bowl of Honey Lemon Sea Coconut (RM18++) and platter of fruits(RM18++) which was refreshing. 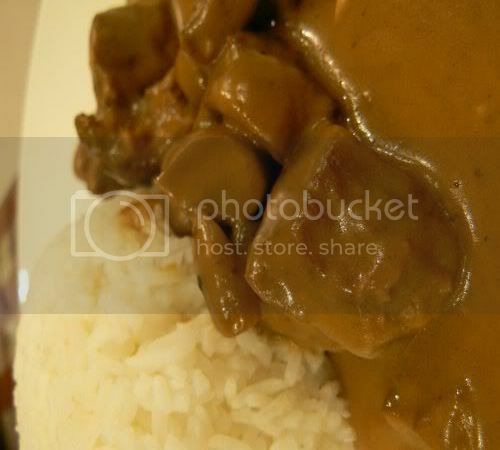 I must admit the food here is really good, my two visits here have been really satisfactory. Now I know why Precious Pea keeps returning here. If you're dining here during the festive season, they do two sittings - 6 pm and 8 pm but do book ahead as it's usually full of people. This weekend, it's all about kitties who pose. 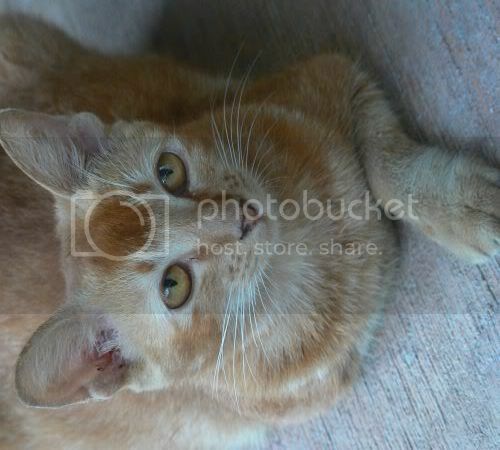 Inspired by Rosa's Yummy Yums' beautiful pictures of Fridolin, I think even the stray kitty at the house wanted to emulate the King. We found out today that the stray kitty who hangs out at the house is an excellent supermodel. Not scared of the camera, she didn't fidget a bit when I snapped pictures of her and even gave me a variety of poses. For more cats that pose, do tricks and get those tummy rubs which all kitties love, visit Kate in the Kitchen. 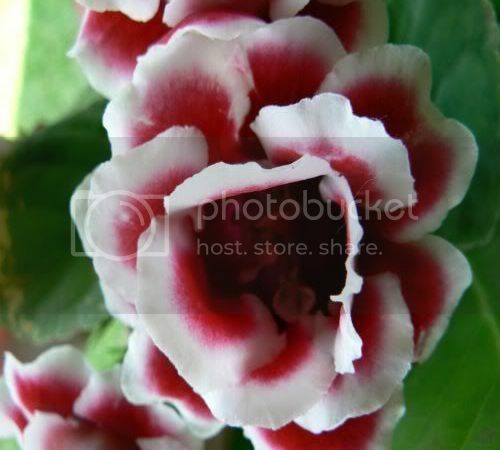 The problem with an extensive archive of photos is I tend to forget what I have. Blame it on badly labeled photos hence I'm only sharing this with all of you now. When I was down a few weeks back in Johor for the flood relief exercise, we stopped over for lunch at a small town known as Parit Yaani. 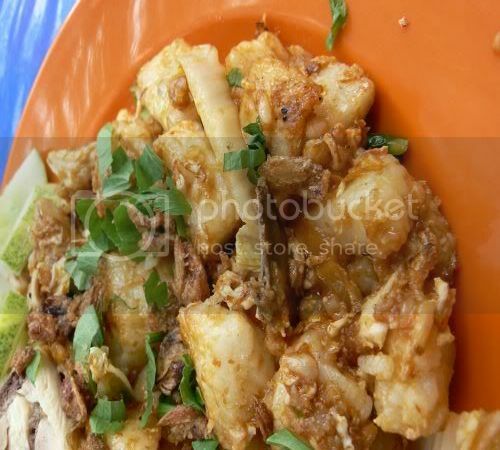 Not much to eat there but I did stumble across an unusual dish known as Lontong Goreng. It's strange to a KL-lite as all we get is the version with vegetable curry here but a quick Google search popped up many references to this dish in Singapore. 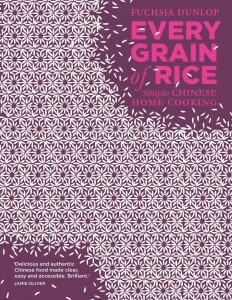 Looks like it's a popular dish down south and there are various types which range from very spicy to not spicy. It tastes similar to char kuih except they add shredded chicken in this version. 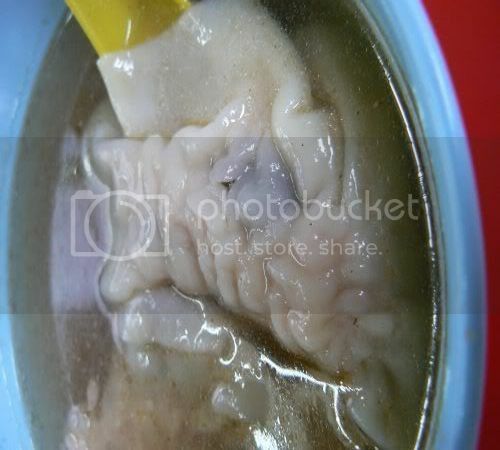 If any of you know places who serve this in Kuala Lumpur, do drop me a comment as I would love to try this again. This particular one I had lacked enough kick in it though hence I'm keen to try it again with lots of chillies. The Bakery has been making a name for itself among Ampang residents with their Ukay Heights outlet where people flock to for their fresh breads and pastries. If you don't feel like driving all the way there, they have recently opened outlets in Hartamas and Damansara Heights. The Hartmas outlet is located on the quieter area where Salero Negori, Bulldog, Aunty Nat and Saffron are while the Damansara Heights outlet is right next to the 7-Eleven at Plaza Damansara. Since it was dinnertime when we visited, most of the fresh breads have been sold out but we did catch their hot meals. Dinner here is an early affair as the place closes at 8 pm. 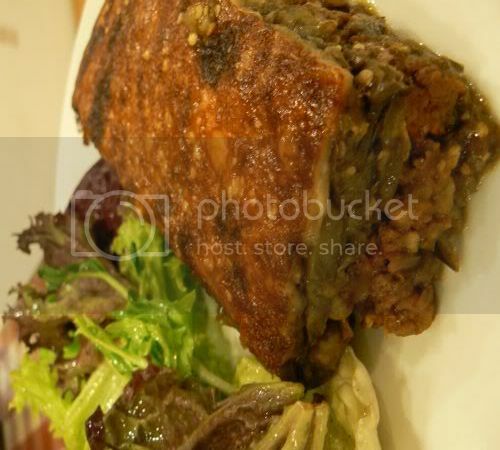 From the menu, I choose their moussaka which came with lots of minced beef and eggplant topped with grated cheese. It's a generous portion and really a good deal as they don't skimp on the minced beef here. 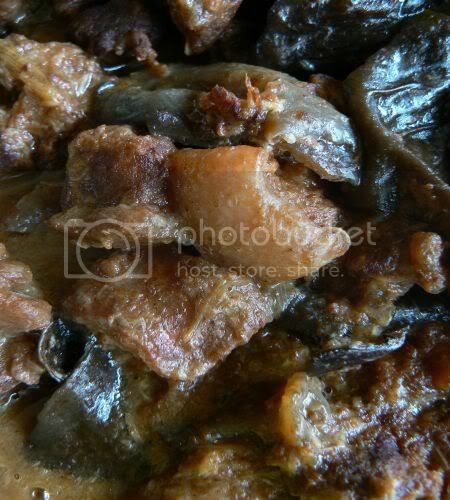 Splashie Boy had the Beef Champi with Rice, his ideal comfort food with chunks of fork-tender beef and mushrooms served with a creamy sauce. Sorry no prices this time round as this came from the archives and the original thermopaper receipt is too faded for me to make out how much we paid. However, I do remember the prices to be average. I've been meaning to pop over there for breakfast but somehow I never seem to find time. Incidentally I also noticed that the Bon Bon Cafe in Plaza Damansara has been recently renamed Siblings Coffeehouse. I guess that means no more yummy Tom Yam Spaghetti and Corn Cupcakes anymore at that place. Back to the grindstone with the holidays over! Am sure everyone had a great break and some of you are still on holiday until end of the week. Yesterday, it was all about places which have opened for business during this festive season. I notice some places have started business back again, mainly the roast duck stalls in Kepong Baru and even at the back of Jalan Pasar. I guess this is the busiest time for them as most families will buy a whole duck or goose for the festive celebrations. Last week, when I read Pasankia's write up about this place, I decided to drop by here on the way to Ikano Power Centre. Although it's not a new place, it's been at Damansara Perdana for the longest time ever (they recently shifted from the same row as Mum's Place to the front shophouses near 7 Eleven and Public Mutual). I keep reading about this place: a write up in Star Weekend long ago and then FriedChillies went recently hence it's been on my to do list. First impressions of the place was good as it was packed with a decent size crowd for a late breakfast. Lots of poached chickens strung outside and occasionally people will come over and pack food to take away. 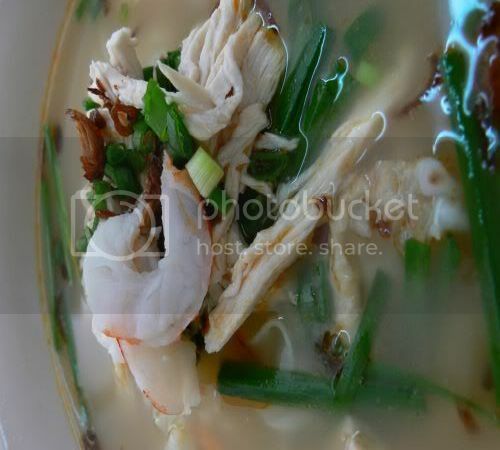 The noodles is served in a huge shallow bowl and topped generously with spring onions, prawns and shredded chicken meat (RM3.50). 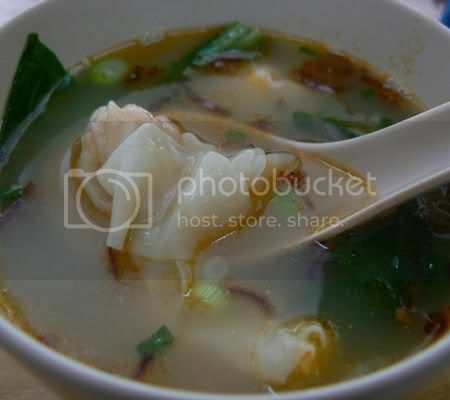 The clear soup is tinged with prawn oil for flavour. Thumbs up to the sweet soup which was exactly like how Pasankia described it and paired with smooth kuey teow noodles. While I was slurping down my soup, I wondered if there was MSG in it since it was so sweet. Now, if you follow my blog faithfully, you should know that I'm ultra sensitive to MSG. By the time I left the place, after eating a leisurely brunch, parked my car in Ikano, I started feeling the effects of the MSG. So dissapointing as it was such a satisfying meal. Since it was brunch, I decided to go all out to try their poached chicken and prawn wantans. I thought the prawn wantans (RM0.50 each) weren't the type to blow me away with as it lacked the crunchiness I like in my prawns. The poached chicken (RM3.00) was tender but I felt the chicken lacked the bite I like in say an organic chicken or farm bred chicken. Instead the poached chicken tasted like those chemically injected chickens we get in the supermarket as the flesh is too soft. Although prices here are much cheaper and portions are better than say Soo Kee in Petaling Jaya, somehow I doubt I'll be making a return trip here since I'm MSG intolerant. During Chinese New Year, finding a Chinese hawker is a rare thing hence I thought this should be shared with all of you who are craving for wantan mee. One of the few places I know which is open during this festive season is this particular stall in Jalan Loke Yew. They started business on the second day of Chinese New Year and it was super packed with people. Most of the stall owners I have spoken to are taking either the week off but some are taking the whole Chinese New Year off as this is their annual vacation. Rumours often flit around on where they go but the general concession is they usually fly off overseas for either a tour package or camp themselves in a casino to gamble. Back to the food here, everything is home made down to the wantan mee which they make their own. The strands here are thinner than the usual wantan mee served in other stalls and has a nice springy texture. 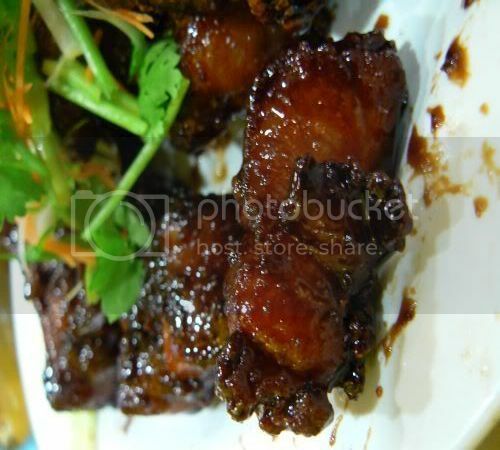 Equally good is the black and sticky char siu which you can opt for a topping. If not there's roast pork, duck, lap cheong (Chinese sausages) and braised chicken feet with mushrooms. They're generous with the wantans and a standard order comes with a huge bowl. They also serve the bigger dumplings, siu kau here. Instead of a tightly bound dumpling and crunchy filling, here it's stuffed with wood ears fungus for extra crunch. 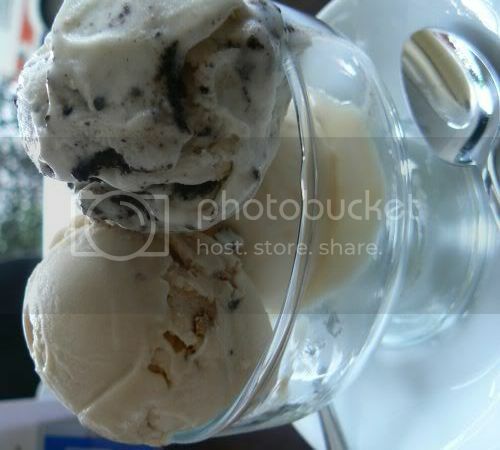 I'm not a fan of it though as I prefer the crunchier ones at Jalan Brunei. Every year, we usually gather at one relative's house to celebrate Chinese New Year. With lots of people around, it's a noisy affair and totally different from how I remember Chinese New Year to be when I was young. Previously we used to visit each of my aunties and uncles from house to house, a tedious affair for us since my dad was one of the youngest out of a family of thirteen children. It was customary that the younger members visit the older ones hence those visits used to be from one end of the town to the other. Since it was such a tedious affair, the family came up with this gathering instead. Initially only my uncles or my father will host this affair and it became quite taxing for everyone hence now my aunt has volunteered to host this yearly event at her house. There's always lots of yummy food and these are only a small fraction of what we ate. 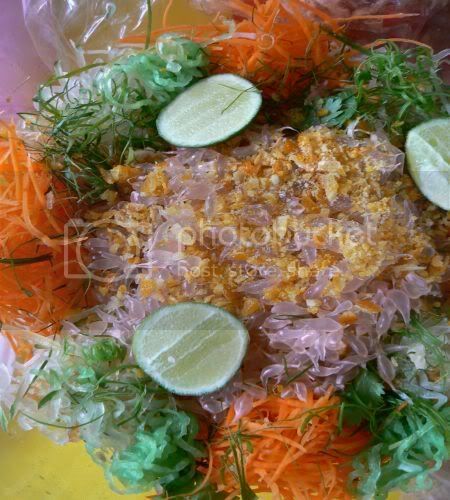 This year we had home made Yee Sang which was yummy since it had lots of pomelo which is always my favourite. 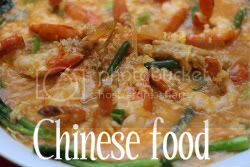 Then there's vegetarian Loh Hon Chai, an essential for the new year as some people are vegetarian on the first day of the lunar new year. For my family, a must is the Hakka Char Yoke since my father's family is Hakka. For desserts, my aunt is an expert jelly maker. 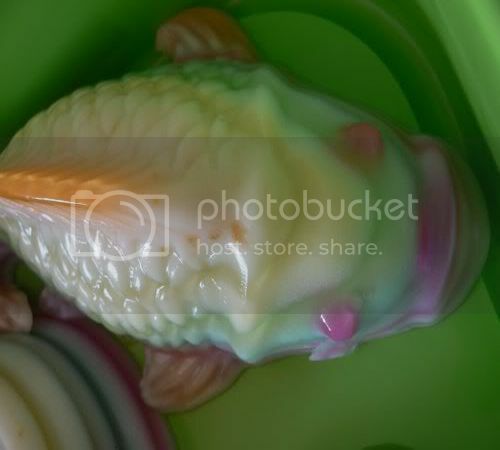 She makes all these interesting shapes and sizes in various colours like this colourful fish. 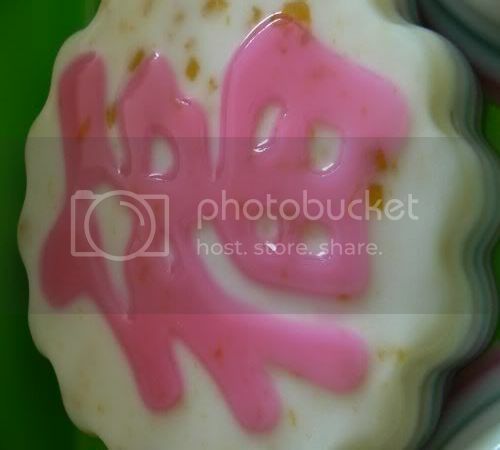 There's also auspicious signs on the jellies. This one I believe shows the prosperity sign (fook). Not too sure since my chinese is horrendous. 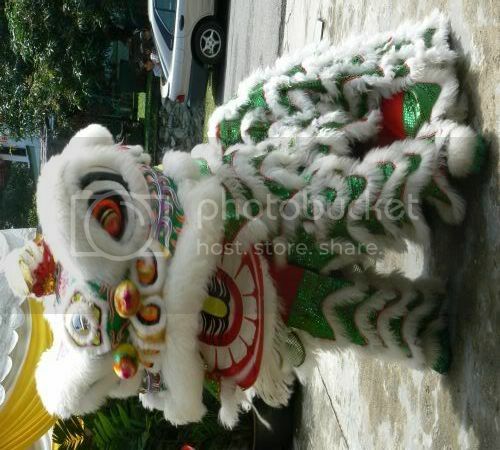 Another must have is the lion dance. Same troupe from last year (if some of you remember) but this year, we even had a visit from the Prosperity God (Choy San) who was distributing mandarin oranges to all. It was fun and luckily this year was slightly cooler with the earlier downpour in the morning. Gong Xi Fa Cai to all of you and do share all your stories on how you celebrated the New Year. Am sure it was a fun time with lots of eating, gambling and drinking. Gong Xi Fa Cai to everyone! Hope the Year of the Boar brings good luck, prosperity and lots of yummy eats for all. Do enjoy the festivities with your family and friends. Even though fireworks are banned, I can still hear faint noises and see flashes of lights in the sky. 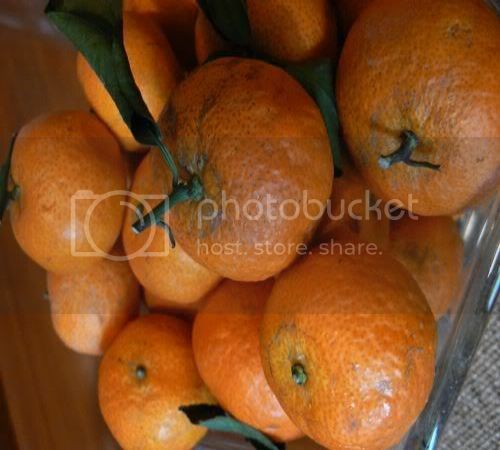 I'm sure the feasting would have started also with the reunion dinner, mandarin oranges, cookies and etc. Since it's the new year, time for a new set of resolutions plus putting aside any differences you have with family or friends. 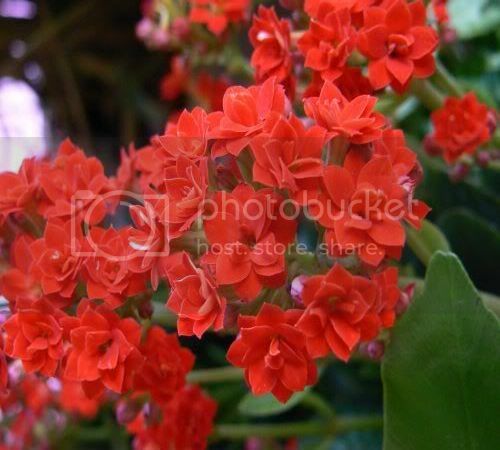 Hope you enjoy the pictures of tiny mandarin oranges plus flowers from the garden. I'm not too sure who's hosting this weekend but since I have an adorable picture of my grey and white kitty playing hide in the box, I thought it should be shared. This fella recently discovered the secret stash of Friskies packed in boxes hence he had fun time hiding in the empty box. Took him a while to realise, it was easy to get in but hard to escape from it since it was quite deep. 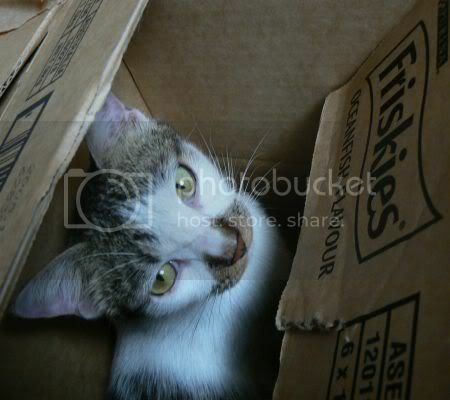 The Friskies is for the strays who have been lapping the free food like they're candies. Luckily we have this stash which we won in a competition or else feeding the strays would definitely take a toll on the wallet especially since the family of strays are forever expanding! Once I do find out who's hosting this weekend, I'll put up the link to the WCB Round Up. In the meanwhile, have a good weekend and yeah, Chinese New Year is just round the corner so tomorrow will see more postings even though it's the weekend. Updated: Kitchen Mage is stepping in with a roundup so leave your links there! Although my favourite Ikan Bakar place is Pak Din's at Tanglin Food Court, I have been exploring other stalls around town. Even though this particular stall is not as fantastic as Pak Din's it makes better sense for those who work down town especially around the Jalan Raja Chulan/Jalan Sultan Ismail area to patronise this place rather than driving through the traffic to the Lake Gardens area. Hopefully traffic will start to ease up from today onwards with the upcoming exodus of people to their home towns. Believe me, I'm looking forward to peace and quiet in the city as the traffic is getting from bad to worst every day. 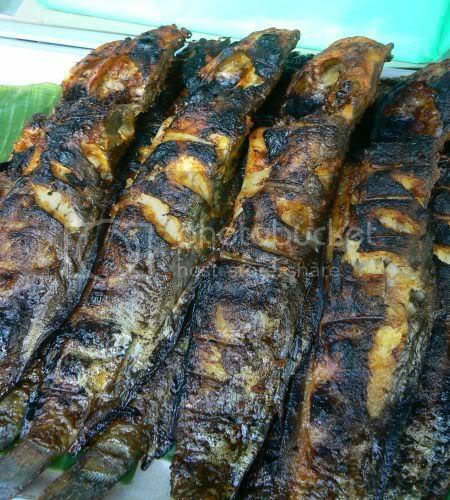 Run by a friendly group of people who claim to be from an island somewhere off Jawa, Indonesia, this particular stall is where people flock to for their ikan bakar cravings. Besides the grilled fish, you can also select from various cooked curries and vegetables set up at the counter. 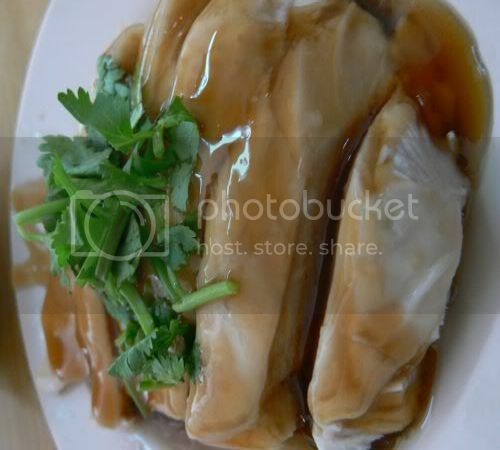 Unlike Pak Din's, the fish is marinated in a special sauce hence it's slightly tinged with yellow. 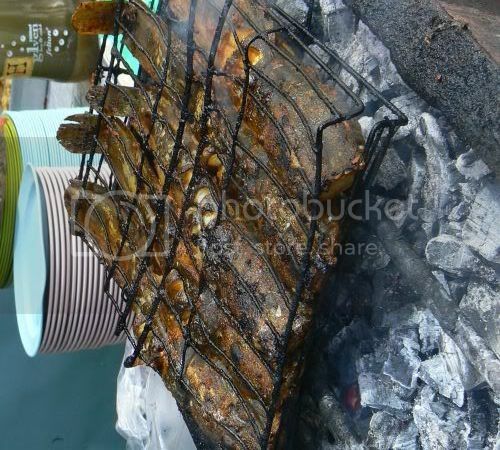 I like how they grill the fish over hot coals as it has less oil versus those grilled in a hot plate. 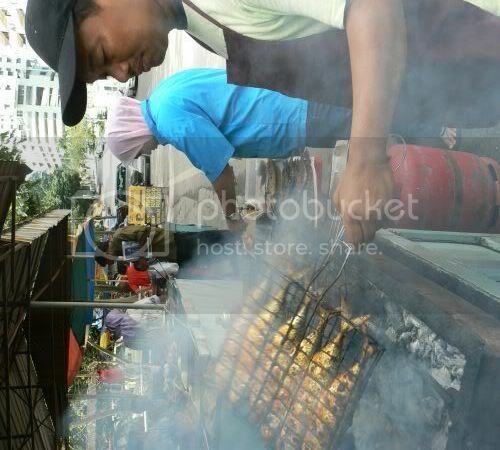 Since the fish takes a while to cook, the stall owners will start grilling them before for the lunch crowd. They serve various types of fish here and you can find old favourites like ikan pari (sting ray), ikan keli (cat fish - my personal favourite), ikan kembung (mackerel) and ikan terubuk. A must with the ikan bakar is the tangy dip made with chopped shallots, bird eye chillies, tamarind, sambal belachan and a squeeze of tiny calamansi limes. 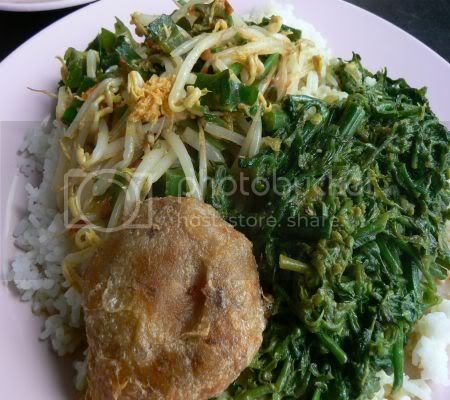 I also love the various vegetables they serve here and my must haves are their pucuk paku (ferntops) and a kerabu made from four angled beans, bean sprouts tossed with grated coconut. Another item I often pick from these Nasi Campur stalls is the bergedil made from potatoes. If you work around here, do walk here rather than drive as parking is a major problem here with limited parking spaces. There's two paid car parks next to the stall but it's usually full by lunchtime. Hope everyone's Valentine Day was fruitful!? Sorry no pictures of my reunion dinner last night as the light was quite horrendous at the restaurant. I did snap pictures but it didn't pass the approval board aka Splashie Boy hence all you get is a running commentary of what we ate. As usual we ended up at Chynna, KL Hilton for dinner - the default choice for my family. The usual favourites also were ordered - chicken with fried ginger, salted egg yolk prawns and spinach in superior soup. For the festive season, we had this dish wrapped in foo chook (bean curd skin) where there's the mushrooms, oysters, fatt choy and etc inside it, a tofu dish with mushrooms and sea cucumber and the salmon yee sang. The yee sang is pretty good here, not too oily and full of crunchy bits and sesame seeds. We also tried a new noodle dish - Kwai Fah Noodles which is fried meen sin that was very good as they fried it dry with bits of egg and lots of scallops and prawns. For dessert, it was the ever favourite Lemongrass Jelly with Aloe Vera Cubes and Lime Sorbet for a refreshing end. Since it was Valentine's Day, the ladies even got a pink rose each. 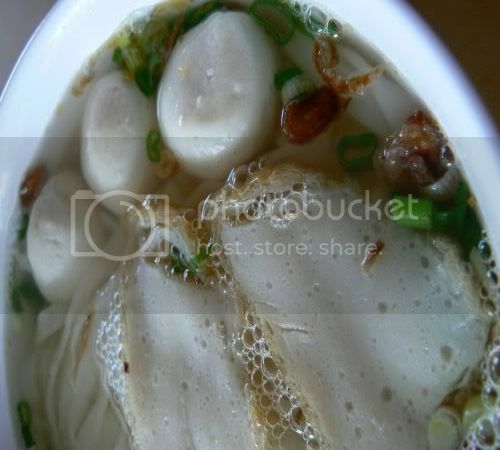 Rather than deprive you of pictures today, I'll be blogging about fishball noodles from Ampang. Although Ampang seems to be more well known for yong tau foo and the Korean Village, I recently found out they also serve really good fishball noodles. 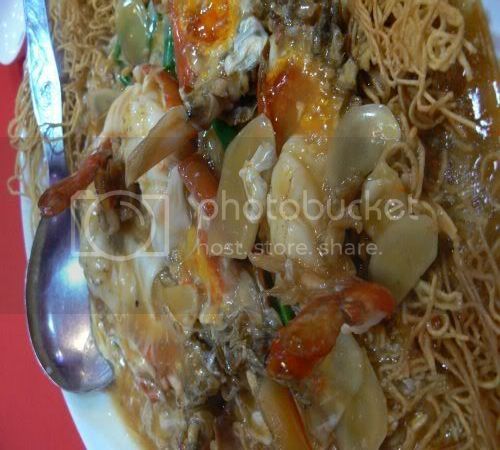 This place just near the famous Foong Foong, Orchard View and Ampang Homeland Yong Tau Foo shops. Pretty easy to get here especially when Jalan Ampang is not choked up with traffic, the whole area where Ampang New Village is located is such a vast contrast with the Ampang Point area. Here it feels like you have stepped back into time as things are slow and similar to a sleepy town. 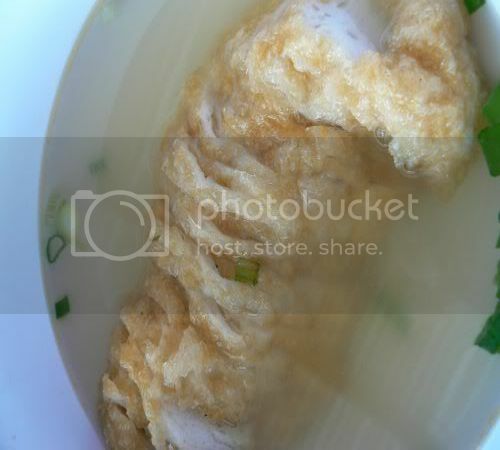 These fishball noodles (RM3.20) - a standard order comes with three fishballs and thinly sliced fishcake with your choice of noodles is excellent. 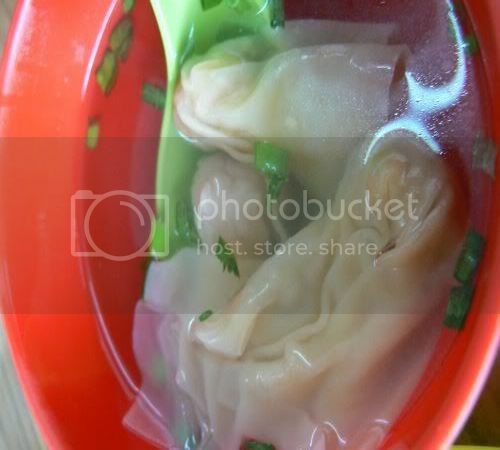 The fishballs are not too springy but taste so fresh and without preservatives. The soup made from boiling anchovies (ikan bilis) is sweet and has no MSG, which is always a plus point for me as I'm really sensitive towards MSG. I had the kuey teow noodles which was smooth. I also ordered the fishcake (RM6.50) which came thinly sliced. Although it's fresh, since it was thinly sliced, I couldn't really taste it but felt it wasn't as nice as my auntie's home made fish cakes. If I do make it here the next time, it will be for the yummy fishballs as they're worth the long journey to this part of Ampang. Happy Valentine's to all of you! Am sure everyone is gearing up for that big romantic lunch/tea/dinner/supper. This year round, our Valentine's plans have been put on hold since we have Chinese New Year reunion dinner to attend instead. Kinda strange I know but that's the only available night for all of us before my mum flies down to Singapore for Chinese New Year. Hence we're going to be spending the night with a table full of my relatives! Well, at least the food will be super good. I wonder if this year I'll pluck up my courage to snap pictures under the watchful eyes of my relatives. It's going to be lots and lots of pictures today as I managed to gather quite a few from my numerous visits to this place. I often get SMSes or emails from friends or even strangers asking me where to eat. This time round, a friend of mine had a specific request. He wanted to take a "friend" out for a not too romantic dinner preferably pasta somewhere in the Petaling Jaya vicinity. My flippant answer was the mamak stall or some tai chow place since that's where I would take a friend but I guess since he specifically stated pasta and dinner could lead to something else better for him in the future, I suggested he try this place in Taman Tun Dr Ismail. We have been eating at this place ever since they opened at Taman Tun Dr Ismail, taking over the short lived Xavier. 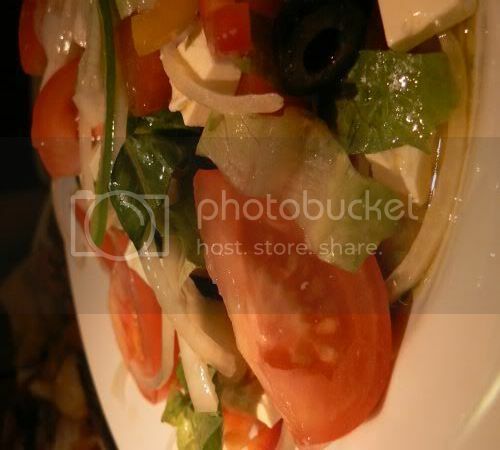 A branch of the City Square outlet, this restaurant serves Mediterranean specials from Italy and Albania. Pictures are of varying quality since some were taken during lunchtime and others at dinnertime under a handy halogen lightbulb with shadows in the background. During one of my visits here, I met a nice chap who sat next to us with his daughter and we got chatting about the restaurant. It seems he's a regular (we had accidentally taken his daughter's favourite table that night) and goes there every alternate night since he stays around the area. 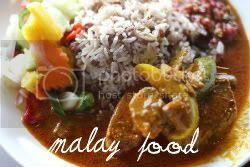 Previously a regular at La Bodega, he felt the food here was much better, bigger portions and at least he didn't need to fight the traffic on the Bangsar hill. 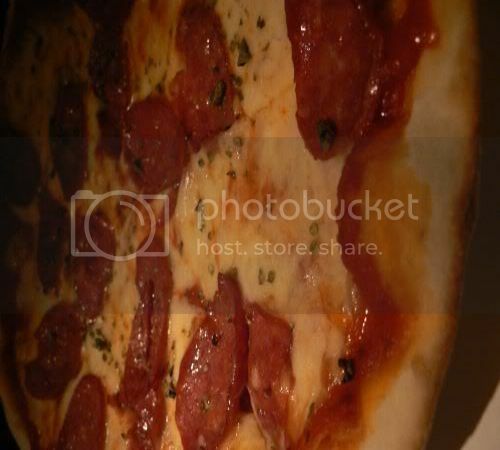 The menu here is quite extensive with choices for antipasti, soups, pastas, rice dishes, pizzas, meat, seafood and desserts. 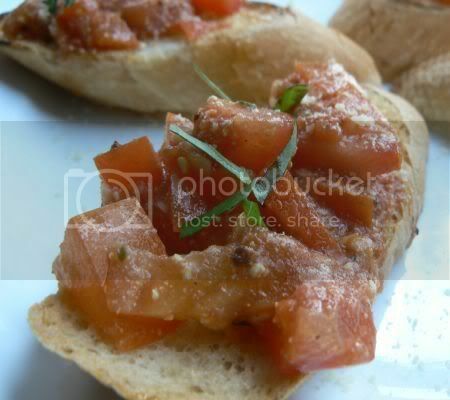 From the antipasti selection, we have tried their Bruschetta with Tomatoes (RM8) that was pretty good. We also ordered the Albanian Village Salad (RM12) that looked slightly Greek with feta cheese cubes and black olives tossed in it. 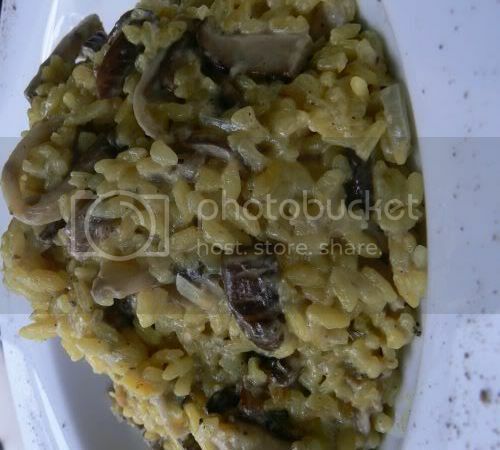 From the rice selection, Splashie Boy tried the Risotto al Funghi (RM21) which was delicious. They're quite generous with the portions hence eating too much of it got a bit too rich after a while. 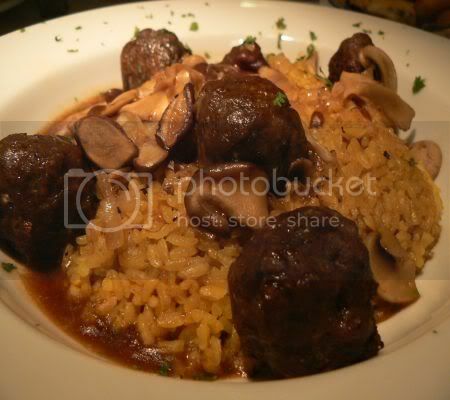 We have also tried another Albanian special - Pilaff with Meatballs (RM26). Although the meatballs tend to be quite dried out, we liked the sauce the dish came with. Since my friends had tasted the mushroom and porto romano pizzas, we went for the Pizza Diavola (RM24) with beef pepperoni. I wasn't too much a fan of it even though the pizza crust was thin and crusty. Although I did not feature any pastas here, I've tried their Porto Romano Spaghetti (RM24.50) which is very good. The tomato sauce which it came in reminded me of Marcella Hazan's sweet tomato sauce. If you want extra kick with your pasta, ask for their home made chilli sauce that is preservatives free. 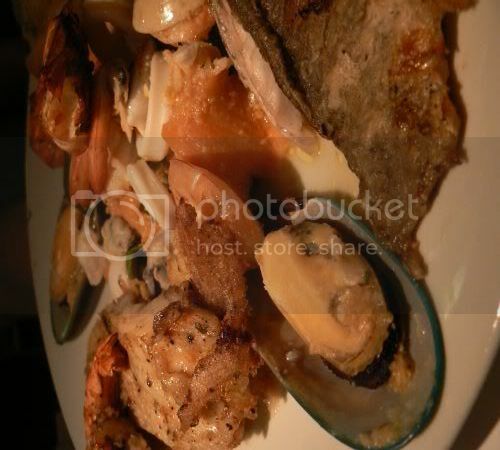 For dinner that night, we shared the Seafood Platter (RM48) which came with a creamy lemon butter sauce as a dip. Chockfull of mussels, cuttlefish, fish, prawns and smoked salmon with a salad, it was yummy right down the last prawn tail. 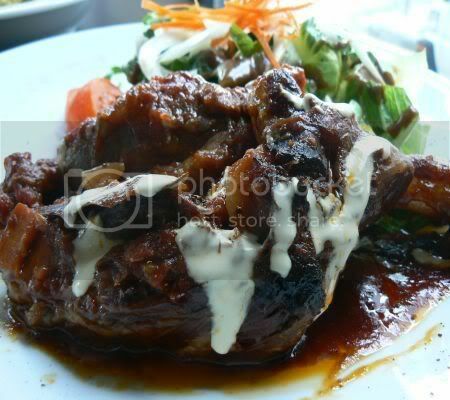 They also do a pretty good Braised Lamb Shank(RM29) with meat falling off the bone. It's a bit drier than the other lamb shank dishes hence you need to slather on the rich tomato sauce. Dessertswise, this place also has quite a few worthy of mention. However, don't order their version of Apple Pie made with filo pastry as it's horrendous - the filling is too spicy and that night we ate it, the pastry was burnt. 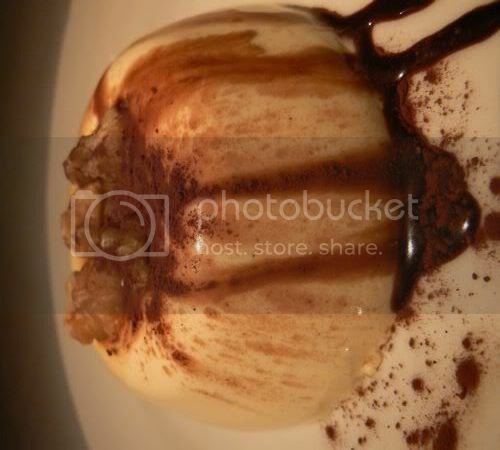 You're better off with their wobbly Panna Cotta(RM9) - a must in any Italian place which is served with walnuts, a sprinkle of cocoa powder and drizzle of a caramel sauce. 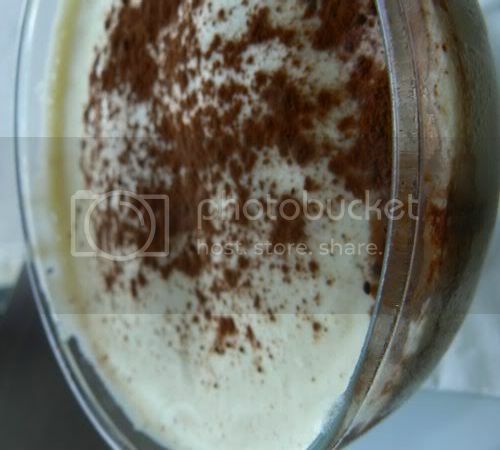 Their Tiramisu (RM12) is pretty good too but depending on which order you get, you'll find varying amounts of liquer. They also make their own gelato with interesting flavours like Kinder Bueno, Oreo and Hazelnut that will be great for these super hot days. I'm not too sure if they're serving Valentine's Day set menu but do make a visit one day and give it a try. I've actually got a wishlist of items to try based on recommendations from the regular diner such as their paella and lamb rack so I'll be making more visits to this place.